Have you ever wondered about the environmental impact of powder coating, and whether it’s a more beneficial option than traditional spray paint? 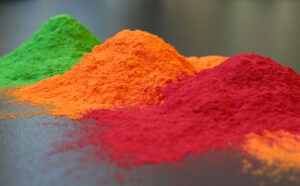 Read on to learn about how powder coating is much greener than other finishing processes. Many traditional paints are solvent based. Solvent based paints are known to be harmful for the environment, as these solvents often contain high quantities of volatile organic compounds (VOCs). According to the EPA, a VOC is “any compound of carbon, excluding carbon monoxide, carbon dioxide, carbonic acid, metallic carbides or carbonates, and ammonium carbonate, which participates in atmospheric photochemical reactions.” Solvent based paints will emit VOCs as they dry (and often for several years after drying), and these VOCs can cause significant environmental damage when they chemically interact with oxides of nitrogen and sunlight to form ground-level ozone, damaging crops, reducing visibility, and more. Meanwhile, these solvents also contain hazardous air pollutants (HAPs) which can also cause harm to humans and the environment. All of this is to say that the environment is much better off without the air pollutants that come with solvent based paint, so when you opt for powder coating over traditional paint, you can rest assured that you won’t be damaging the environment with harmful gas emissions. Unlike with spray painting, the overspray that results from powder coating can be reclaimed and reused. (In fact, many powder coating facilities incorporate a reclaiming system in order to facilitate this reclaiming process.) This makes the powder coating process a highly sustainable process with a transfer efficiency of over 90 percent. This is extremely high when compared to the spray painting process, which has a transfer efficiency of maybe 50 percent if you’re lucky. Specialists in the powder coating industry aren’t the only ones to recognize the environmental benefits of powder coating over traditional paint. Electrostatic powder spray processes are actually universally accepted and recognized as as the Best Available Control Technology (BACT) to reduce air pollution. This recognition goes hand-in-hand with the Clean Air Act of 1970, which aimed to reduce air pollution and in many ways propelled powder coating processes to the forefront of the industry. The durability and high quality finish that comes with powder coating surely make it a popular finishing option today, but its low environmental impact may have been what made it such a mainstream finishing process in the first place.